The Aristolochiaceae, or Birthwort family, are a family of flowering plants with seven genera and about 400 species belonging to the order Piperales. The type genus is Aristolochia L.
They are mostly perennial, herbaceous plants, shrubs, woody vines or even lianas. The membranous, cordate simple leaves are spread out, growing alternately along the stem on leaf stalks. The margins are commonly entire. There are no stipules. The bizarre flowers are large to medium-sized, growing in the leaf axils. They are bilaterally or radially symmetrical. The Aristolochiaceae are magnoliids, a basal group of angiosperms which are not part of the large categories of monocots or eudicots. Some newer classification schemes place the family Aristolochiaceae in the order Piperales. Many members of Aristolochia and some of Asarum contain the toxin aristolochic acid, which defence against predators, in this case herbivores. It is known to be carcinogenic in rats. 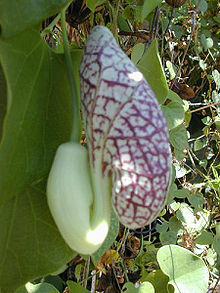 Aristolochia itself is carcinogenic to humans. Pipevine swallowtail butterflies lay their eggs on pipevine (Aristolochia species), and the larvae dine on the plant but are not affected by the toxin, which then offers the adult butterfly protection against predators. This page was last changed on 10 March 2015, at 02:33.